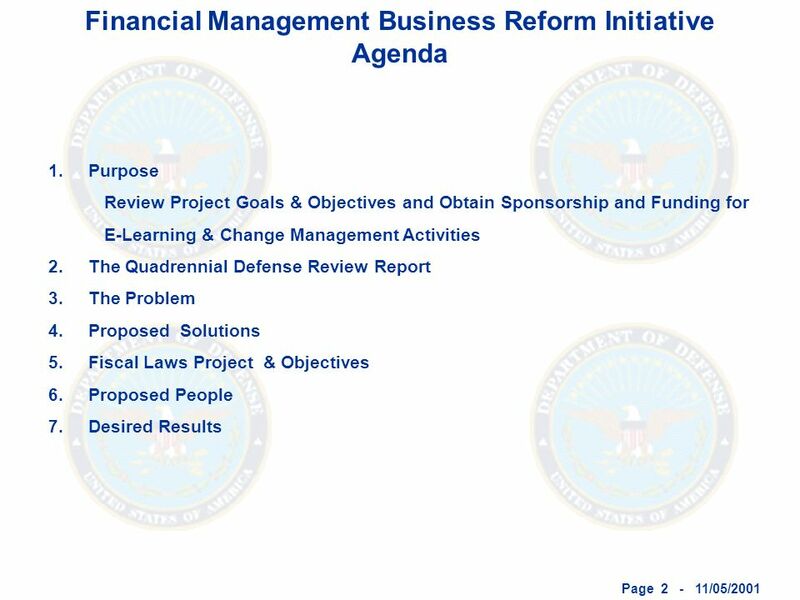 Page 1 - 11/05/2001 Department of Defense Change Management Center Financial Management Business Reform Initiative Thomas Bloom Briefing November 05, 2001. 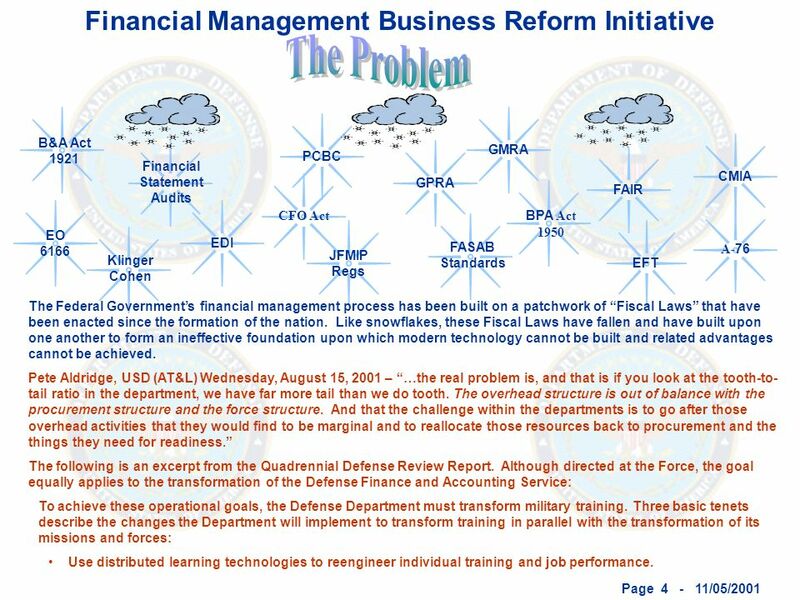 Download ppt "Page 1 - 11/05/2001 Department of Defense Change Management Center Financial Management Business Reform Initiative Thomas Bloom Briefing November 05, 2001." 1 The IT Service Management Performance Challenge IT Service Management in the Federal Sector – A Case Study. 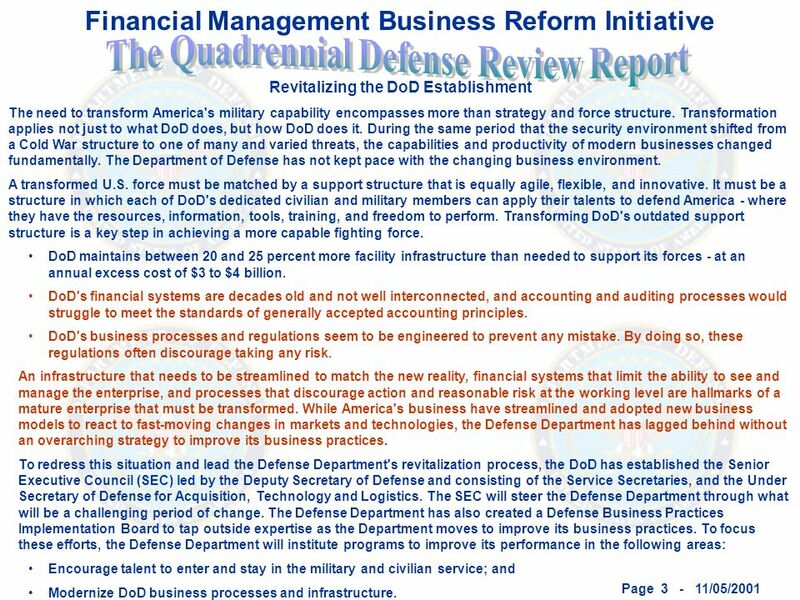 Page /27/2001http:// Department of Defense Change Management Center Financial Management. Eileen T. Powell coreFLS Project Director Department of Veterans Affairs Washington, DC Presentation for Secretary of Veterans. 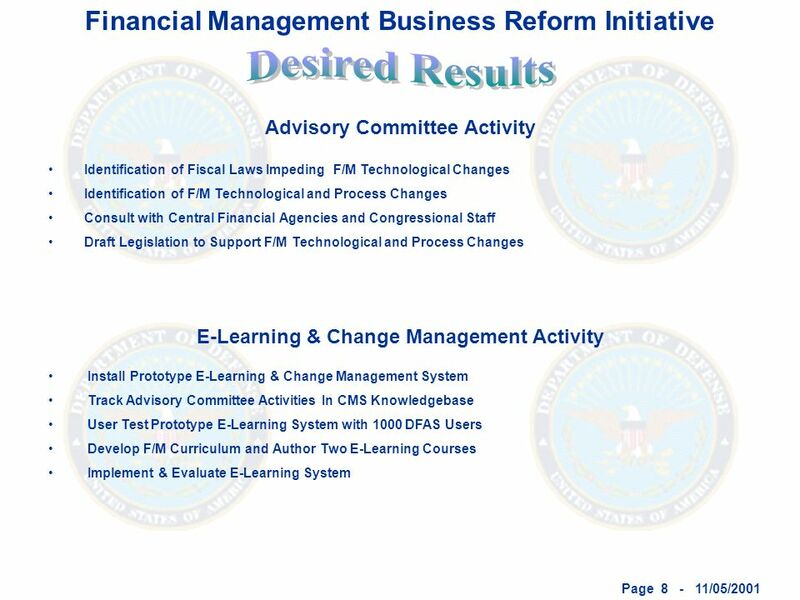 Page /31/2001 Department of Defense Change Management Center Financial Management Business Reform Initiative Mary Margaret Evans Briefing October. 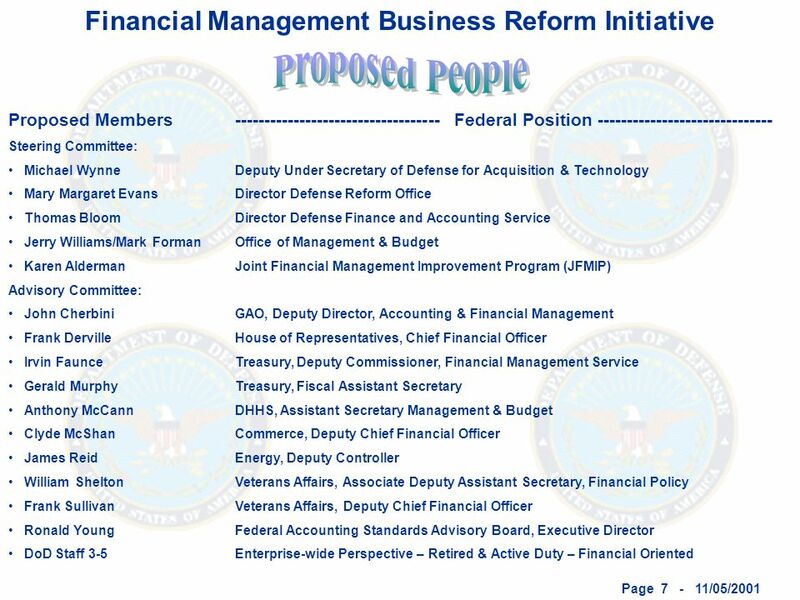 Page /27/2001http:// Department of Defense Change Management Center Financial Management Business. 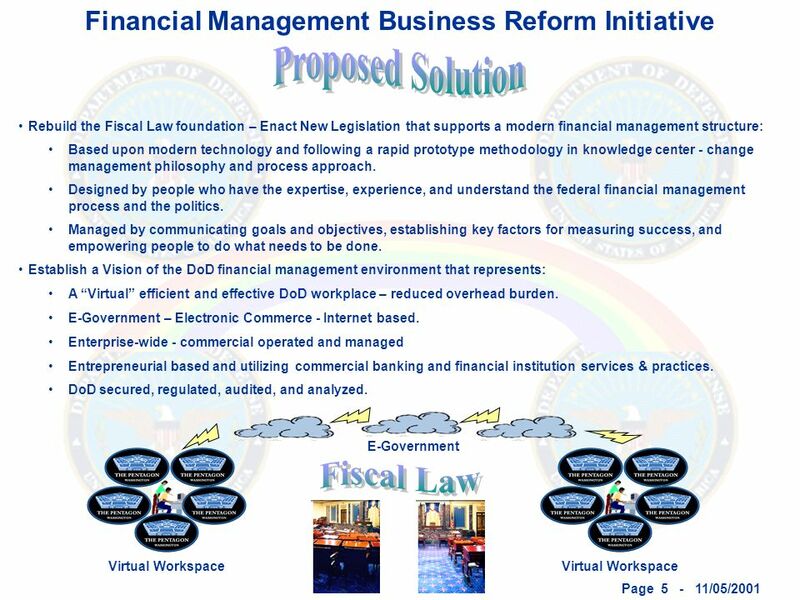 Fiscal Law Proposal (Removing Impediments and Defining Financial Management in the 21 st Century) Mary Margaret Evans Director. 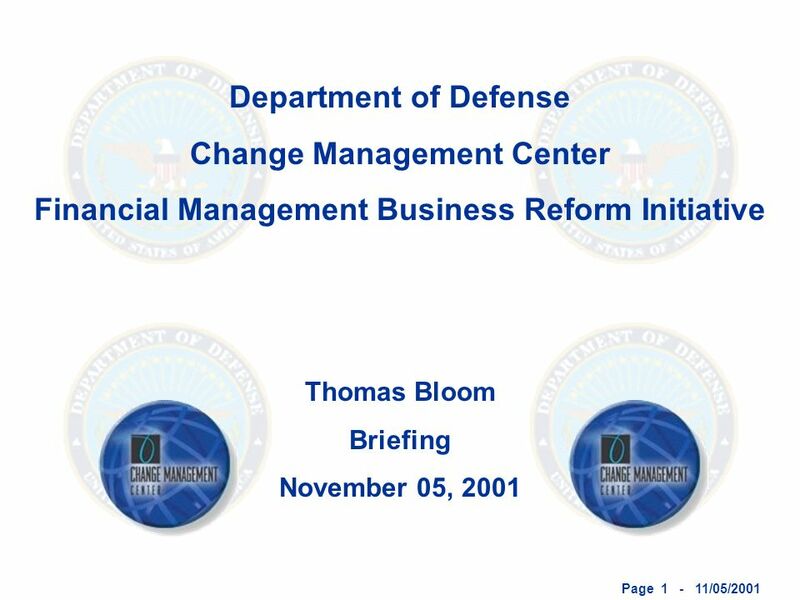 Page /31/2001 Department of Defense Change Management Center Financial Management Business Reform Initiative Thomas Bloom Briefing November 05, 2001. Fiscal Law Proposal Mary Margaret Evans Director DRAFT. Review of Fiscal Law December 4, 2002 DRAFT. Change Management Center 2 DRAFT Overview Purpose & Objective Challenges Assertions Partnership Basic Approach. DRAFT Fiscal Law Proposal. Fiscal Law Project 2 DRAFT Fiscal law is the body of law that governs the availability and use of federal funds and accountability. Review of Fiscal Law December 18, 2002 DRAFT. Change Management Center 2 DRAFT Overview Purpose & Objective Challenges Assertions Partnership Basic Approach. Review of Fiscal Law December 4, 2002 DRAFT. 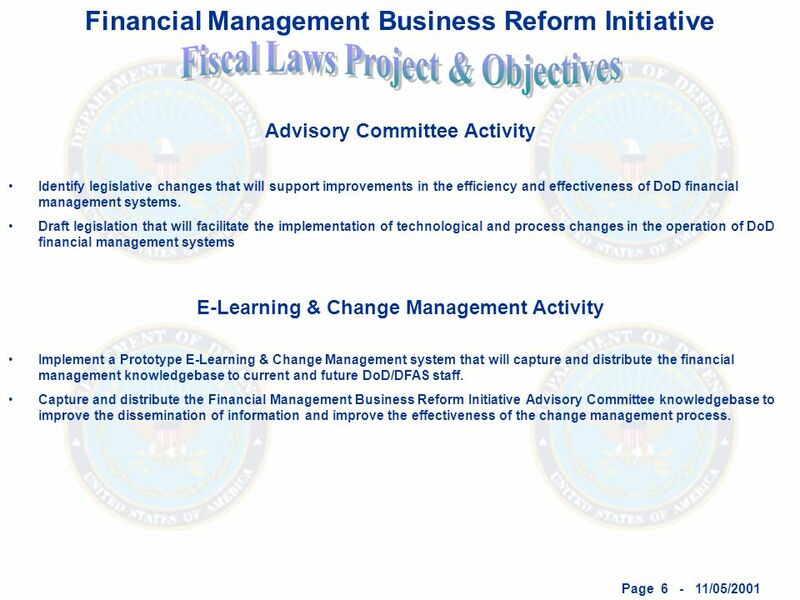 Change Management Center 2 DRAFT Overview Purpose & Objective Challenges Management Directives Partnership. Review of Fiscal Law December 6, 2002 Judith S. Boyd. Defense Reform Update for Secretary of Defense William Cohen by Stan Soloway November 8, 1999 Defense Reform Update for Secretary of Defense William Cohen. Product Support Manager Conference Incentivizing Industry Panel Vice Chair, Logistics Division National Defense Industrial Association 15 January 2015. Civilian Agency Acquisition Council Ralph De Stefano Director Contract Policy Division Civilian Agency Acquisition Council. The DATA Act Legislative Branch Implications. “ “The DATA Act is about to shake up federal operations.” --- Joseph Marks, NextGov, 4/28/14. DRAFT 12/18/02 Fiscal Law Briefing. Fiscal Law Project 22 DRAFT  Fiscal law is the body of law that governs the availability and use of federal funds. 1 Federal Grants Streamlining Michael Nelson Director, Grants Management Division.